She is the all-embracing mistress of ceremonies. With concentrated respect she transforms the stage into a sacred space. Her meditative gestures move between far-Eastern traditions and Western dance language. 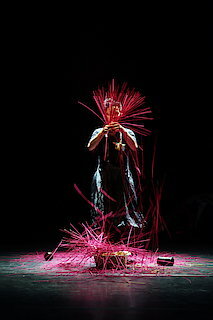 Lee Su-Feh undertakes a public ritual involving joss sticks and a tangled mass of flying parchment messages. The ritual is also highly personal and reveals her striving for knowledge – to experience who we are, where we come from and where we are situated in a cosmos in a state of constant transformation. And at the end she gives her ancestors a treat by smoking a cigarette.